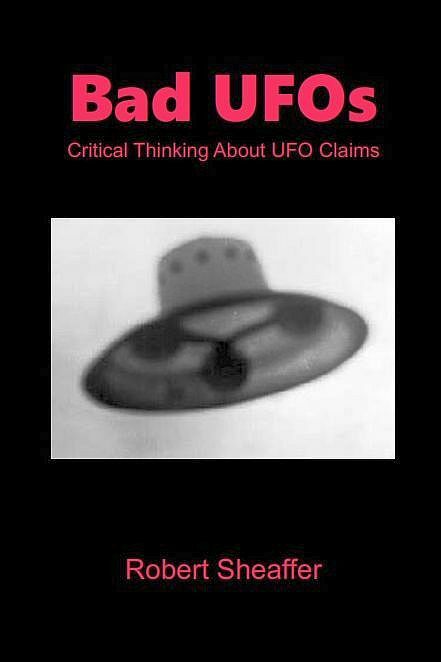 Bad UFOs: Skepticism, UFOs, and The Universe: Some Comments on the History Channel show "UFOs On The Record"
I refer to the phrase "One of the most convincing pieces of evidence for the existence of UFOs", used by Leslie Kean. Think back and count the number of times you have seen or heard this phrase. There have been so many during my long UFO 'career' that I lost count ages ago. It is usually in the form of a photo or film, or what at first sounds like a truly remarkable sighting but then is re-analysed, hotly disputed and assumes a far lesser significance. That Belgian UFO photo both fascinated and disturbed me for years. Although it took a good long time and took in many in the interim, ultimately it followed the sad trajectory described by CDA. It will be interesting to see how Ms. Kean reacts to the questions that are sure to come. I felt the program was the best I have seen on the subject of UFOs in quite a while. In fact, the Douglas Trumball work instilled a sense of optimism in me that I had all but lost. Mr. Trumball seeks real evidence and the producers of the show felt his efforts warranted inclusion in their story. Will he have success? He is one person surveying a tiny fraction of the planet for a transient phenomenon. The odds against him are immense. It's his thought and example that evidence is both vital and still lacking that warmed my heart. "Ferryn also appeared on Belgian TV on July 26 to argue that the bogus UFO photo from Petit-rechain does not in any way invalidate the Belgian UFO wave that began in November of 1989." Just for the sake of being really exact, Patrick Ferryn didn't appear on television that day. He was on holliday at the time (bad luck), and thus could'nt answer interviews easily. He did say what you wrote in your bologpost, but it appeared only in that article that you linked (text only), on the website of the belgian television RTL. So not on TV per se, but in an article published on the website of a belgian TV. Auguste Meessen was on the radio and TV that day (he went to ask questions to the hoaxer, and a TV crew was there at the time), and on the skeptical side of things you had Pierre Magain "debating" him (it was not a real debate, but Magain justs said the opposite of what Meessen just stated before during 10 min.) one or two days later on the same TV channel. The way that UFO enthusiasts respond to the revelation of outright fraud in relation to their "most convincing evidence ever" is sadly predictable: cognitive dissonance and increased prosthelytizing. After George Adamski was exposed as a transparent fraud, his believers became even more convinced. And casual saucer buffs can still be heard saying how George must have had a real experience at first but then had to fake some evidence so that he could keep spreading the good word. I interviewed several folks who were ripped off by Otis Carr. Every one of them still thought that Carr was sincere. After my revelations about Phillip Imbrogno there were many pleadings that this exposure should not cause believers to throw the baby out with the bathwater. They wanted to hold on to his "research". And Leslie Kean doesn't bat any eye when her "holy grail" (I believe she use those exact words in a Facebook posting that showed her reveretially holding the Belgian UFO slide) is shown to be another tin cup. Kean also places great respect in the work of Richard Haines. Robert, have you ever read one of Haines' faux-scientific papers "analyzing" a dubious UFO photo? They aren't scientific at all--they simply have a veneer of science terminology and instead simply lead toward a forgone conclusion. A recent one I read doesn't even consider a photographic anomaly for a photo that looks to be a glare or reflection. He doesn't even mention this as a possibility! Instead he goes right into talking about a craft etc. etc. This silly stuff must really wow the rubes because Haines is often held up as one of the most respected of the UFO "researchers". Being a "respected" researcher and being "the most convincing evidence" seems to have a similar unintendedly hilarious meaning among saucer buffs. Please start showing history and no more reality crap! It is getting very old watching your cheap alligator and pawn junk. I am sure it cheaper for you to make, but it is uninteresting and stupid. The American public is much smarter than what you are showing. It is time you took pride in your work. Right now, it is now showing most of the time. "Kean has no difficulty referencing investigations by other researchers, so long as their conclusion agrees with hers." This is probably the most detailed investigation of the case. And why is it that there generally can't be anything found on this blog about NARCAP? Dear Robert, you wrote that "the low ceiling might easily have briefly opened up to reveal a much higher cloud layer". Which mechanism would allow such a brief and easy opening of the lower cloud deck? If it was not a hole punch cloud, then what was it? It seems to me that what you have presented here is nothing but an untested hypothesis. I personally find it hard to believe that the independent witnesses would all mistake the opening of the lower layer for an object flying underneath before realizing what it truly was after the formation of the real hole punch cloud. Would we not, at best, only expect a change of color? What must be the dimensions of both holes for making the delusion real? I'd be far less Skeptical if you could demonstrate me through a realistic computer simulation that the combination of these two phenomena would well account for what the witnesses perceived to be the case. One more thing. You also tend to quote selectively. bank would be too thick for such a hole to go clean through"
You obviously disagree. On what scientific grounds?